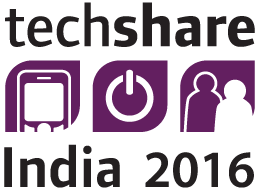 We offer our sponsors at Techshare India extensive opportunities to create visibility and benefits for your organization, ranging from complimentary registrations, to free exhibit space and display of your logo in various publications. To find out about sponsorship details, email us at: sponsorship@barrierbreak.com or call us: +91-22-26860485/6. Accenture is a global management consulting, technology services and outsourcing company, with more than 358,000 people serving clients in more than 120 countries. Combining unparalleled experience, comprehensive capabilities across all industries and business functions, and extensive research on the world’s most successful companies, Accenture collaborates with clients to help them become high-performance businesses and governments. Adobe is the global leader in digital marketing and digital media solutions. Our tools and services allow our customers to create groundbreaking digital content, deploy it across media and devices, measure and optimize it over time, and achieve greater business success. We help our customers make, manage, measure and monetize their content across every channel and screen. Wipro is globally recognized for its innovative approach towards delivering business value and its commitment to sustainability. Wipro champions optimized utilization of natural resources, capital and talent. Today Wipro is a trusted partner of choice for global businesses looking to ‘differentiate at the front’ and ‘standardize at the core’ through technology interventions. At Pearson, we have a simple mission: to help people make progress in their lives through learning. We are the world’s leading learning company, with 40,000 employees in more than 80 countries helping people of all ages to make measurable and meaningful progress in their lives. We provide a range of education products and services to institutions, governments, and individual learners that help people everywhere aim higher and fulfill their true potential. G3ict – the Global Initiative for Inclusive Information and Communication Technologies – is an advocacy initiative launched in December 2006 by the United Nations Global Alliance for ICT and Development, in cooperation with the Secretariat for the Convention on the Rights of Persons with Disabilities at UN DESA. Its mission is to facilitate and support the implementation of the dispositions of the Convention on the Rights of Persons with Disabilities on the accessibility of Information Communication Technologies (ICTs) and assistive technologies. In India, we believe, there is no lack of information but lack of access to information. Digital Empowerment Foundation (DEF), thus, works towards bridging the digital divide by finding sustainable ICT solutions in under-served and unreached parts of India to enable better access to benefits and rights for the masses. It is also engaged in advocacy and research on all digital areas and such issues as Internet rights and right to information. DAISY forum of India is a network of organisations, university, School and Public libraries that provide books and book reading services to persons who cannot read normal print. DFI envisions that any published book is made available to persons with print disabilities on very first day of its publication and at no additional cost. The organisation is working to end the book famine for them through collaboration, sharing of resources, capacity building, technology development and outreach programmes. Community Business is a not-for-profit organisation whose mission is to lead, inspire and support businesses to have a positive impact on people and communities. Recognized as a thought leader in corporate responsibility and diversity and inclusion in Asia, Community Business conducts research, facilitates networks and events, leads campaigns and provides consultancy and training. Union Bank of India believes that technology and careful consideration can make a major difference in bringing financial inclusion. Bank’s ‘Truly Accessible Bilingual TTS technology based Talking ATM’ launched in June 2012 at BPA, Ahmedabad has set a benchmark on accessible banking in India. Bank has prepared accessible user manuals on Talking ATMs and deployed 1700+ talking ATMs. Bank has achieved certification as the “FIRST” accessible IT solution in India of its kind by the LIMCA Book of Records for its “Talking ATM for ALL” project. Radio Udaan, an online Radio Station produced and thoroughly managed by the persons with visual challenges of India. The foremost purpose of Radio Udaan is to bring the voice of the disabled to limelight and to be the tool for talent hunt and exhibition. Commenced on 2nd February 2014, Radio Udaan now hovers across more than 100 countries and envelops more than 20,000 listeners per month. “By the blind of the blind for all” is the theme of us. Volunteers for the Blind is a voluntary organization working in the field of rehabilitation of the blind. Their activities include projects and programmes of their choice, priorities desired by beneficiaries, orientation and motivation of volunteers, sharing of information, assistance to government as desired and development of technology applications. In selected areas they work in collaboration with NGO’s working in other disabilities as well as international organizations.